The Jaffna University Students' Union (JUSU) Friday requested the Prime Minister to take immediate steps to disarm all para military Tamil groups including the Eelam Peoples Democratic Party (EPDP) in areas held by government troops. "The retention of arms by such para military groups, including EPDP constitutes imminent danger to Tamil civilians and journalists in the Jaffna district," the JUSU said in a memorandum sent Friday to the Prime Minister Mr.Ranil Wickremasinghe. The JUSU has further expressed its dissatisfaction over the manner the UNF government is having talks with the EPDP to come to an understanding, after the general election. "We are thoroughly dissatisfied to note that the UNF government's talks with the EPDP, is contrary to its assurance given in its election manifesto that it (UNF) would not have any dealings with the EPDP". EPDP had been an ally of the People's Alliance when it was in power. "The para military groups including the EPDP have been allowed to possess arms by the last PA government in the name of self-defense. But these groups use arms against Tamil civilians and journalists to meet their own ends," states JUSU in its memorandum. It may be recalled that the Tamil National Alliance in a memorandum submitted to the Prime Minister last week called for the total disarming of all Tamil para military groups, which yet continue to retain arms. 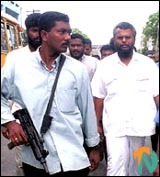 The memorandum said, "the retention of arms by such Tamil para-military groups constitutes grave and imminent danger to unarmed Tamil political parties and the fundamental rights of the Tamil civilian population, in the northeast province particularly in areas such as the Islands off the Jaffna peninsula."